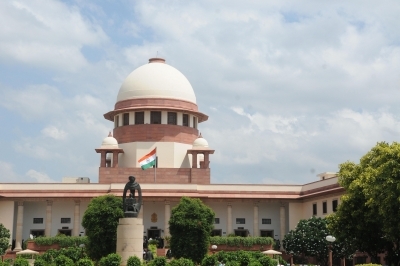 New Delhi April 16 (IANS) The Supreme Court on Monday refused to stay the release of regional film "Nanak Shah Fakir" based on the life of the first Sikh Guru Guru Nanak Dev saying the Constitution allows filmmakers to make any movie as long as it does not impinge on secularism. Refusing to interfere with its last week s order directing the states to ensure that no obstruction was caused in the release and screening of the film a bench of Chief Justice Dipak Misra Justice A.M. Khanwilkar and Justice D.Y. Chandrachud said: "As long as the film does not denigrate Sikhism and it only seeks to glorify Guru Nanak Dev we will not interfere..."
After the earlier apex court order the film released on Friday (April 13). The court s Monday order came on a plea by the Shiromani Gurdwara Parbandhak Committee (SGPC) which contended that there could not be any portrayal of Sikh Gurus their immediate family members and the Panj Pyaras by any mortal beings. As senior counsel R.S. Suri appearing for the film s producer Harinder S. Sikka said the producer and the SGPC representatives should meet and see what more can be done the court asked the SGPC counsel to consider the offer and directed the next hearing on May 8. The court also noted that "Nanak Shah Fakir" has got the National Integration Award in the category of regional films. Appearing for the Sikh body senior counsel P.S. Patwalia referred to a 2003 resolution of the SGPC which was reiterated in 2015 that there cannot be a depiction of Sikh Gurus by any living being. Chief Justice Misra said "let the character playing Guru Nanak not take credit for it and let it be an abstract person" adding that once a film has been certified by the Central Board of Film Certification the court can t interfere. Justice Chandrachud said no religion can say that "only our book would portray our religion and stop everyone from writing about it. This would encroach into secularism". As long as the film does not denigrate Sikhism and Guru Nanak Dev s portrayal is venerated and as an abstract man he said "we can t interfere". The Constitution protects filmmakers to make films the court said as long as it does not impinge on secularism -- the basic philosophy of the Constitution. Senior counsel Ram Jethmalani who was present in the court and was asked to give his views said any religious injunction against the release of a film should be backed by legal sanction. If the injunction is purely religious the court has to ensure that the right of the filmmaker is not violated he said. Describing the latest position of the SGPC as a summersault senior counsel Suri said the film was approved by a committee of five eminent people who praised it. He said in deference to the suggestion by the committee Guru Nanak "is shown as light and his teachings are being narrated by one of his Muslim disciples Bhai Mardana".